Ornamental medium to large, upright shrub Bright orange flowers winter to spring with serrated grey-green leaves. In its natural habitat it grows in deep red sands on coastal dunes and plains where the average rainfall is less than 8". Frost tolerant to low 20 degrees F. Seed follicles are usually opened by fire. 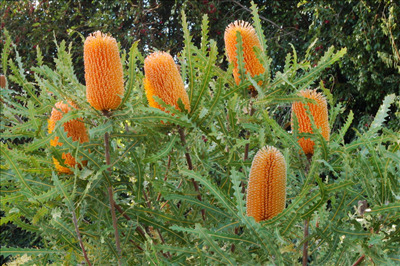 Fast growing and usually produces terminal cut flowers 3-5 years from seed. Will tolerate some alkalinity and extended dry periods and is very frost tolerant once established (20F) It is susceptible to Phytophtora cinnamomi if conditions have poor drainage, excessive moisture and hot weather. Requires deep infrequent watering to establish deep roots in the first 2 years. Do not prune on old wood or could kill the plant. Great bird attracting plant, screen or hedge.